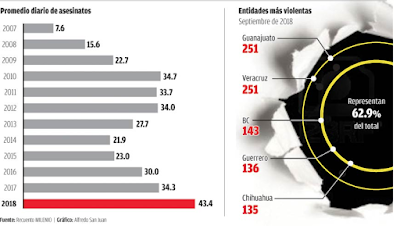 In September, 456 homicides related to organized crime were committed, a figure that ranks as the second highest in the sexennium, only behind the 1,532 victims registered last January, according to the monthly count of MILENIO. 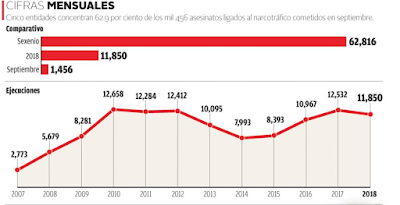 During the nine months of 2018: 11,850 murders have been reported, which results in a daily average of 43 violent deaths by the hands of drug traffickers and/or organized crime, while in 2017 the average was 34. 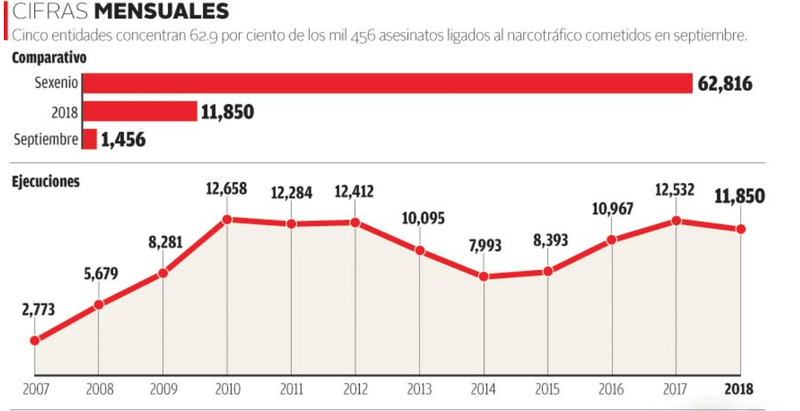 In absolute numbers, this year is 682 homicides to equal the annual number of executions in 2017 and, in addition, only 808 crimes are missing so that this year it becomes more violent since the MILENIO count began, in 2007. Since 2015 there is a sustained trend in the increase in murders committed for the crime. In 2015, 8,393 homicides were perpetrated and for 2016 the figure reached 19,967 cases, in 2017 12,532 were counted and it is projected that at the end of 2018: 15,800 fatalities will be reported. In September, criminals committed two homicides every hour, averaging 48.5 daily homicides. This average is located above the index of what goes in 2017, which is located in 43.4 cases. The red/ hot centers were concentrated in Guanajuato and Veracruz. In each of these states, 251 murders were committed, respectively, and between the two, one out of every three homicides perpetrated in the country was committed. 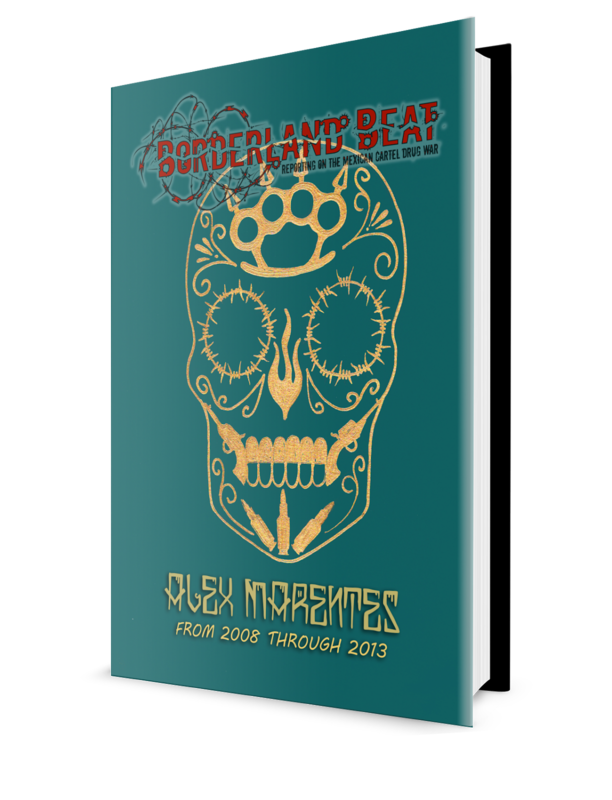 The entity of the Bajío has positioned itself in 2018 as the bloodiest demarcation of the country by adding a 1,598 executions in nine months. Only in this year there is an increase of almost 60 percent with respect to the murders committed in 2017. The dispute over drug trafficking and fuel theft between the cartels of Jalisco Nueva Generación and the local Santa Rosa de Lima group has left figures so alarming that between 2017 and 2018 there are 59 percent higher number of homicides committed in the region than in the last decade. The operations of the federal government have proved insufficient to fight organized crime in Guanajuato. In December 2016 the Army increased its presence in the entity and last July 3,200 elements arrived to stop the insecurity and the theft of trains and pipelines of Pemex; however, the indexes remain high. 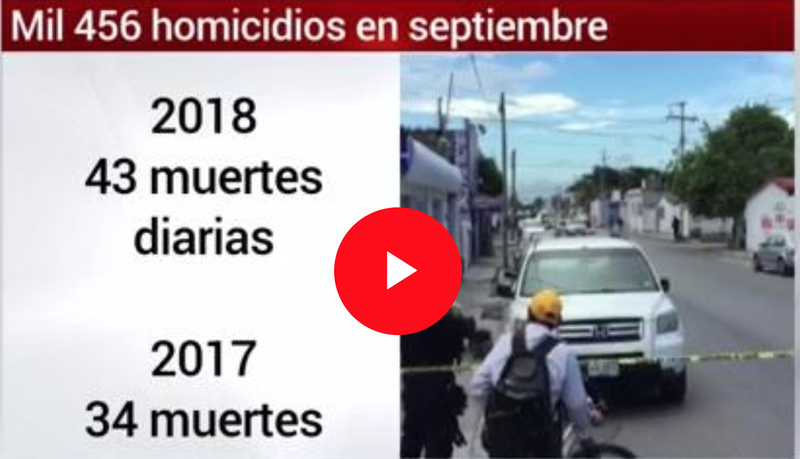 In Veracruz, 1,575 murders have been committed so far this year, an increase of 7 percent over the number accumulated between January and September 2017. In addition to the increase in murders, the new findings of clandestine graves in the entity reveal a greater dimension of the insecurity that exists in the entity. Other violent entities in the last month were Baja California, with 143 homicides; Guerrero, with 136, and Chihuahua with 135. The violent day of yesterday left a balance of 26 dead in nine entities, which highlights the confrontation between the military and armed individuals in the mountain area of ​​Badiraguato, Sinaloa, where a soldier died. In Acapulco, Guerrero, a commando attacked the Atenango mayor's office and murdered two elected officials who would take office. The authorities reported the death of four people in different events. In Oaxaca, four people were murdered for apparent criminal disputes. While in Tamaulipas five members of organized crime were killed by police. Authorities confirmed of the execution of Samuel Deraz, "El Güero" Canesten, member of the CJNG, in Tijuana. In Veracruz, the murder of five people was reported; in CdMx, two; Puebla, one, and Michoacán, one. This is what the U.S. wants. "Divide and conquer". This is in hopes that while cartels are busy fighting with each other as well as within each other they will have no time or leadership to send drugs into this country. Of course this doesn't work and only leads to many perhaps uneccesary deaths but as long as only Mexicans kills themselves it does not matter. Your theory is illogical. Access to the US market is the very reason the cartels fight each other. @7:19 you think only one dimensional. Imagine a wolf pack composed of say 10 animals plus the leader or "alpha" wolf that dominates all the others by being the toughest literally. Now imagine the alpha wolf dying suddenly for whatever reason. How do the wolves choose another leader? At least a few will fight each other to ensure dominance and become the new alpha of course. This while having to perhaps fight off other wolf packs as well. It it survival not plain greed that causes wolves as well as people to fight each other. 2:45 man is the worst of the animals, and The Alpha Man is the worst of all of them when you couple political, military and intelligence power with the worst of his allies trying to please his even as Secretary of Defense with more than 50 years experience like "general" Salvador Cienpedos serving EPN. 7:48. Just remember that drug production in Columbia is at an all time high regardless of the war waged against production there decades ago. You are correct that alpha man is the worst but supply of drugs is a direct result of demand meaning not just dealers are to blame for drug production. Tijuana used to be safe, now you have spotters, to alert kidnappers, of people to kidnap. Lots of tourist dollars being lost. Wow just look at in the graph in 2007,an average of 7 murders per day only 11 years ago compared to the 43 now!Really shows where the power lies. Who thrives when so many people die? 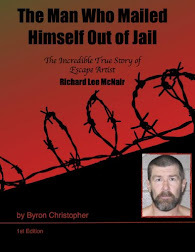 No the other meth traffickers, or the maruchaneros or the pumpkin seed vendors, it is always someone at the top of the feeding chain, military and police that know their marks.